NEW BRITAIN—Eight fire recruits, including three women, have joined the New Britain Fire Department following a graduation ceremony held on Friday, Dec. 11th at Central Connecticut State University. The graduation is an historic one, as three women will be joining the New Britain Fire Department. In its entire history, only two women have served in the City’s fire department: the first was hired in 1989 and retired in 2011, while the second individual was hired in 2007 and is still working. 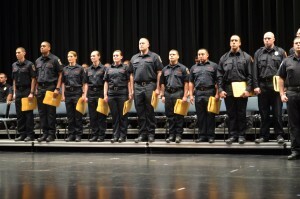 Matthew Abdifar, Joshua Aponte, Petra Chesanek, Lauren DiMitruck, Eric Dutkiewicz, Katherine Galezowski, Hector Garcia, and Nicholas Raiola are the eight firefighters who graduated from the Connecticut Fire Academy’s Recruit Class #56. The graduation exercises were held at CCSU’s Welte Hall. The firefighters were hired on Aug. 30th and have been in training for 15 weeks and will now attend four weeks of internal training and orientation with the New Britain Fire Department before being assigned to a fire company. In addition to the eight graduates who are joining the New Britain Fire Department, the City has also hired three lateral transfers. These individuals include volunteer firefighters who have paid their own way to attend the Recruit fire fighter training program, veterans who have used the GI Bill to attend, or firefighters coming from another fire department. The hires bring the total number of New Britain firefighters to 126 members. The New Britain Fire Department was established in 1833.